An Anagram is the result of using the rearranged letters of a word or phrase exactly once to create a new one. For example, an anagram of “listen” is “silent” as it’s spelled with the same letters. An Anagram Generator, as the name suggests, is used to generate anagrams instantly. You use it for fun to find interesting anagrams for any word or phrase, or as a handy companion for crossword puzzles and scrabble. 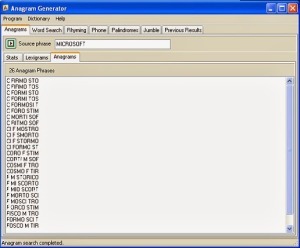 Anagram Generator, a software created by Jason Rampe, is an exellent anagram generator for Windows. Aside from anagrams, it can also create lexigrams, a phrase composed of letters found in a given word, so you can discover new words in a fun way. Lexigrams generally use personal names as the source phrase to find new words by rearranging its letters. Then, the words are organized to describe the owner of the name. Another useful feature of Anagram Generator is that it can generate reverse dictionaries. A reverse dictionary is organized in a non-standard way in which the sorting is based on the words’ last and subsequent letters. It’s a useful dictionary for poets or linguists looking for words with a specific ending similar to Oxford Dictionary. You can easily search its dictionary using wildcards. This is useful if you do not know exactly what you’re looking for. With wildcards, you can simplify the process by searching for a word or group of words that match your search criteria. An interesting feature you’ll want to give a try is finding letter equivalents of your phone number; see if your number spells anything meaningful. You can also search for palindromes, a word or phrase which has the same meaning in reverse or forward direction. An example would be “Anna” or “Amore, Roma“. It can also search for words that rhyme, a useful feature for song writers and poets. Helps you solve Jumble puzzles, too. Anagram Generator is free and has dictionaries in English, Spanish, French, Italian, German, Japanese, and Dutch like Oxford Dictionary. It supports Windows XP/Vista/7/8/8.1/10. 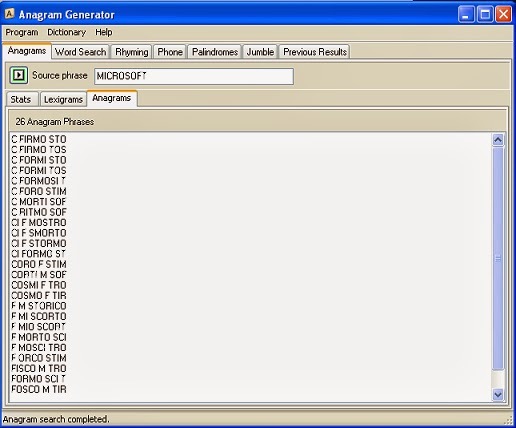 If you’re looking for a good anagram generator for fun or help you solve word puzzles quickly, Anagram Generator is a fast, friendly, and easy to use piece of software.